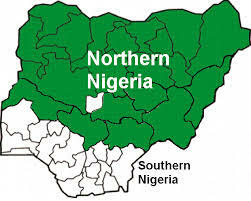 O Otega's blog: Northern and Southern Nigeria? I just read a post on Vanguard titled " What is the North afraid of " by Muyiwa Adetiba. There were a lot of examples described in this post, but whar got my attention was the part about a divided Nigeria. Imagine if Nigeria was separated before now into: Northern and Southern Nigeria. How would the northerners handle the threat of Boko Haram? With the recent hike in food prices, for example, the cost of tomatoes and peppers. How would the northerners cope, if they are unable to sell their food produce, let's use the southern Nigeria, as their major customers, when the price is high. The southerners have always boasted about having oil and how oil is the major source of Nigeria's income. Now that oil sale is plummeting, and oil companies are retrenching staffs. How would this southerners cope, now that their major source of income isn't booming like before? There would be a lot of distrust and greed when such crisis occurs and this would be catastrophic. Nigeria would be a greater country, if all these rivalry between the South and North ended. It may be that the South may strive better than the North or vice versa, but we cannot say accurately what would happen in such a situation. The Niger Delta avengers will continue to cause havoc in Delta state and thus the progress of Nigeria, as they are allegedly destroying oil pipelines in the state, and until there's a negotiation favorably for everyone, these militant groups will continue to thwart with Nigeria's progress. I am in support of Muyiwa's closing point, that, "....what people really want are transparency, fairness and inclusiveness in governance. Plus a lot of give and take. The central control is stifling and a disincentive to communal growth and development. The time to negotiate is now". The South shouldn't be left out because it's a Northerner ruling Nigeria now. Every region should be included in Nigeria's growth and development not just the North or South. P.S: United kingdom is made up of Scotland, Wales, Northern Ireland and England, maybe North and South Nigeria would be called United kingdom of Nigeria or United states of Nigeria, loool. Thanks for reading. Have a fabulous weekend and don't let Lagos traffic dissuade you from going out, haha.